Final result (click to enlarge). 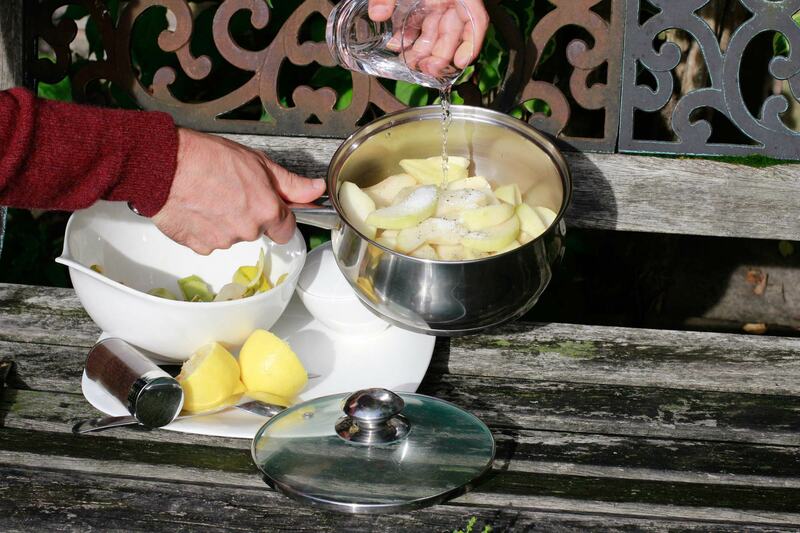 I used less than a third of the stewed pears to fill the three cups, which weighted around 120g each. 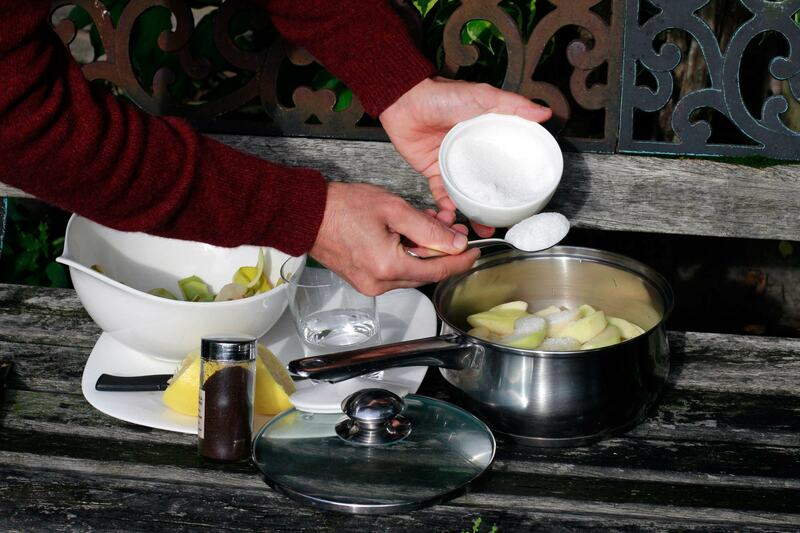 Cup one: the healthy stewed pears with plain yoghurt. Cup two: slightly more indulgent with redcurrant and raspberry jam*. Cup three: rich, but still a fresh melt-in-the-mouth delight thanks to the pears, with medlar and apple jam** and double cream. Although already my favourite, a few roasted almonds on top of the medlar one would have made this an even more special dessert. The yoghurt one was slightly disappointing, yoghurt goes better with the texture of a compote or a puree in my view. The redcurrant and raspberry one: the jam brings a nice colour and acidity that sharpens the mix. * Redcurrant and raspberry jam: frozen redcurrants provided by Abundance Wimbledon, raspberries picked in a South-West London pick-your-own. Recipe: see under the Abundance Fruit Day 21st Sep 2013 heading in the main bar. 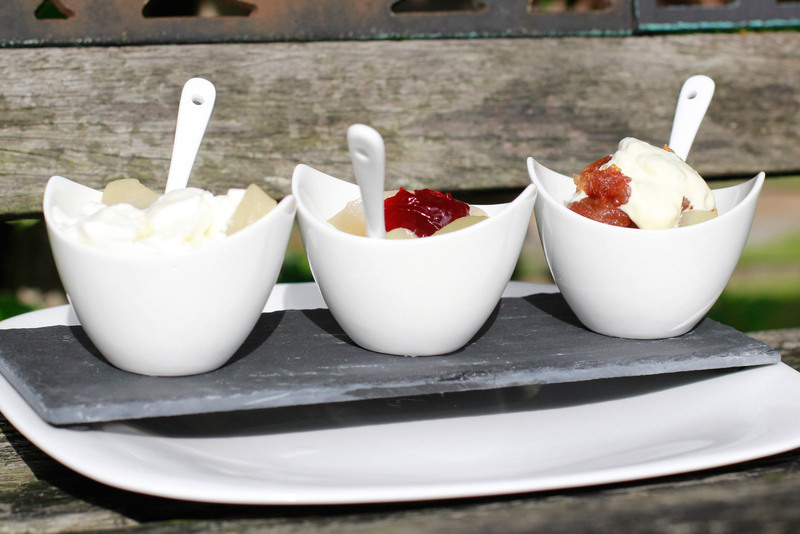 ** Medlar and apple jam: made with fruit from Surrey. Ingredients: three of the ripe pears, very large, lemon juice, granulated sugar, vanilla (click to enlarge, same for photos below). Peel. This pear from Southfields weighted an amazing 395g! Core the juicy pears. 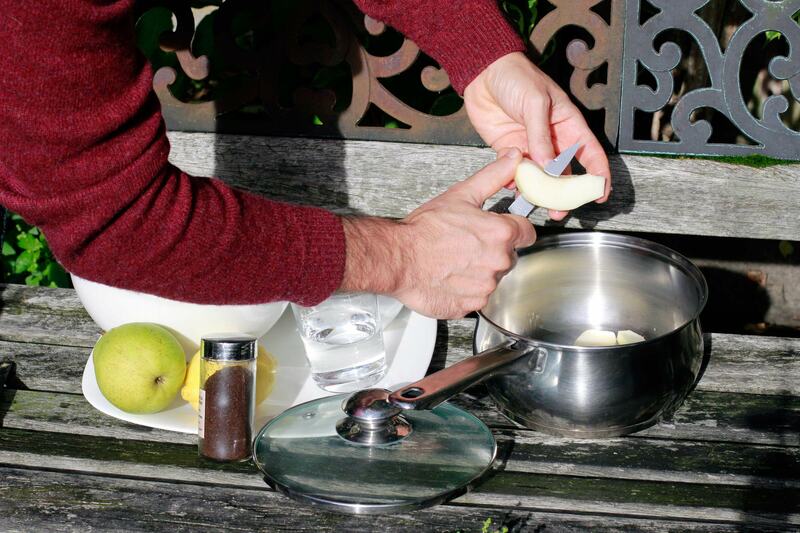 Actually pears that are less ripe can be used, it will still make a tasty dessert. Cut in half-a-centimeter slices, or bigger, or of a different shape, as you like. Add a few drops of lemon. 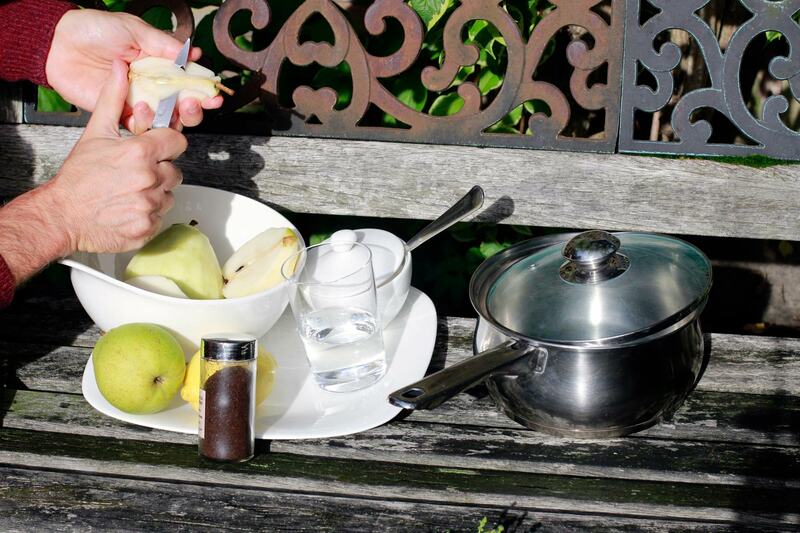 It gives some acidity, and keeps the original colour of the pears better by preventing oxydation. Can do without it. Sugar, according to personal taste. One spoon is usually enough for us and sometimes we don’t add any sugar at all. A hint of vanilla. Gives a pleasant taste, yet some will prefer just the natural taste of a perfectly ripe pear. Could also use cinnamon, etc. Water. 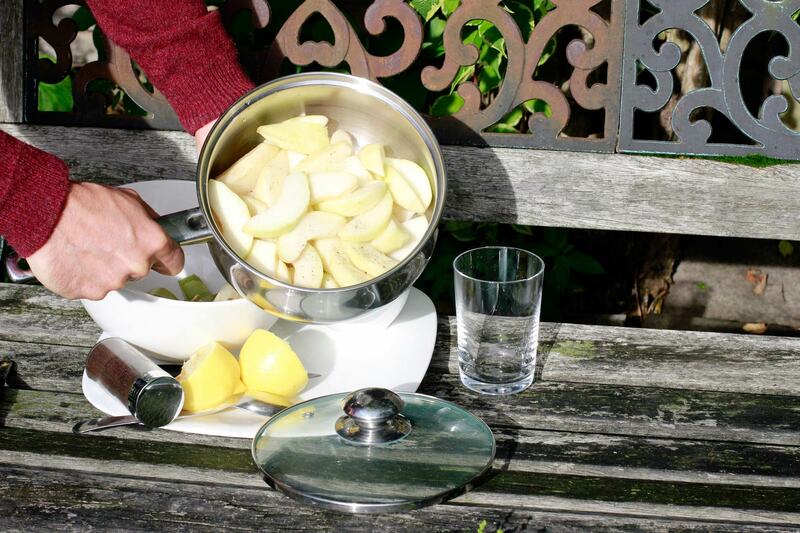 Half a small glass will already give plenty of juice, if cooked in a pan with a lid. 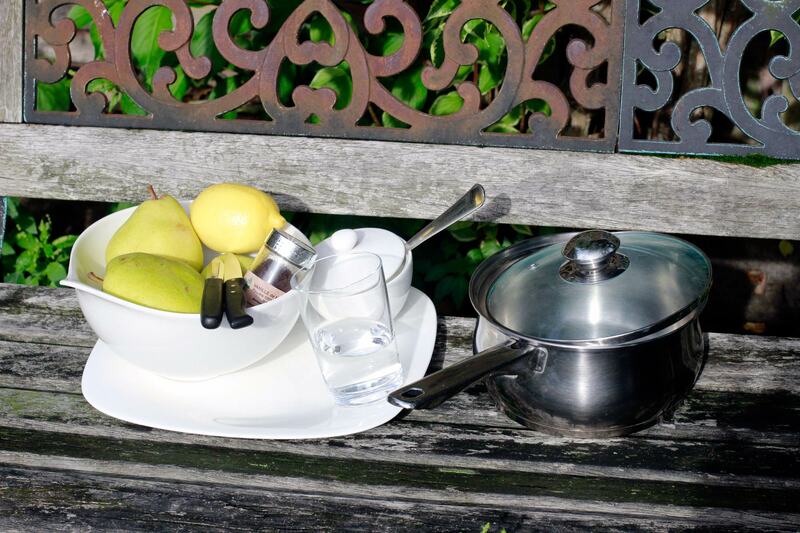 Check when cooking without a lid, and add water before it dries out. 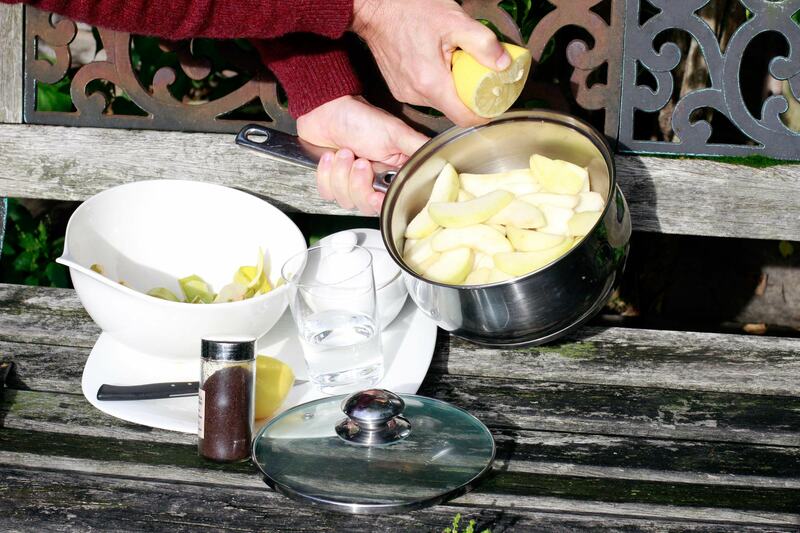 Or leave the pears to caramelise, this needs close monitoring for them not to burn but can give a delicious result. Ready to go on the hob! It took five minutes to get to this step. 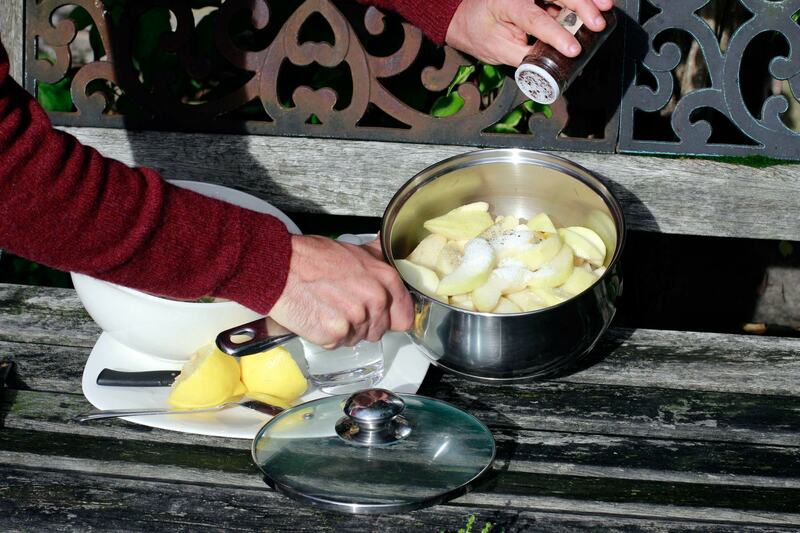 It only took ten minutes for these pears to be simmered on medium gas heat. Stirred twice, did something else in the kitchen the rest of the time. Some varieties, or less ripe fruit, may take longer to cook. Just test the consistency by tasting one morsel, taking care of not burning yourself. 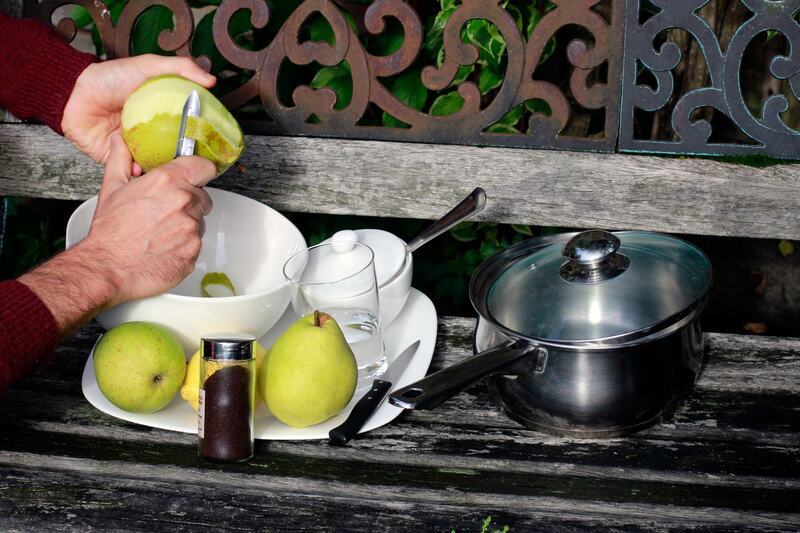 The pears are ready to be dressed! If you have no time to let them cool down, putting some in the cups will help. Some like them cold, some hot. 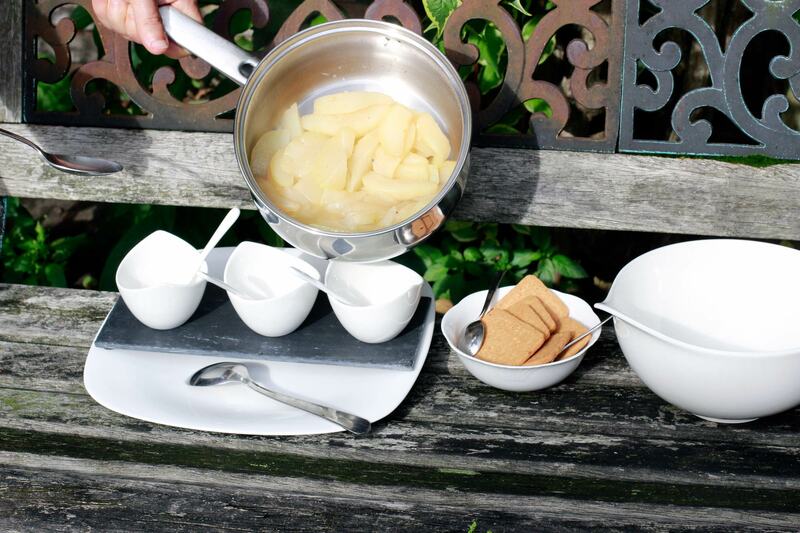 Why not trying warm pears with ice cream for example… Your can now express your talent, which will enable to treat yourself and your guests. Be creative! 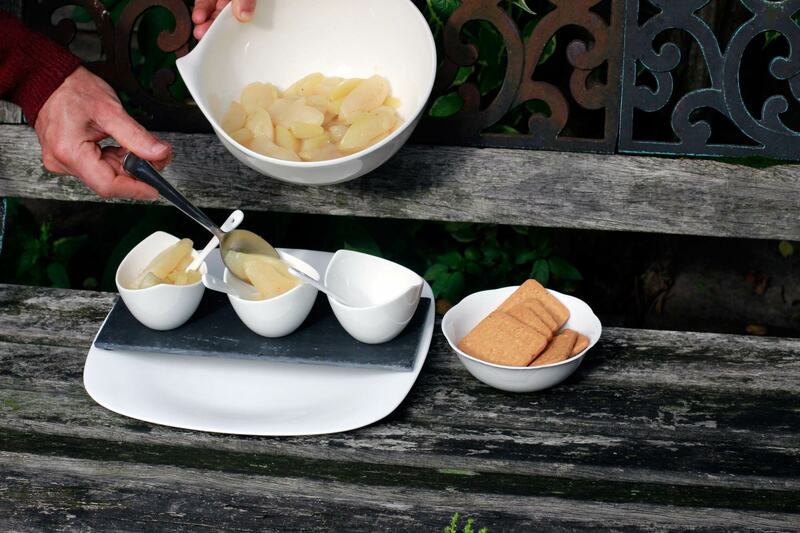 Or just eat the stewed pears as they are, with a biscuit for instance, it is just delicious! This entry was posted in Eat and tagged Pears, Pick-your-own, Raspberries, Redcurrants, Southfields, Surrey, UK, Wimbledon by Les Jardins d'ici. Bookmark the permalink.